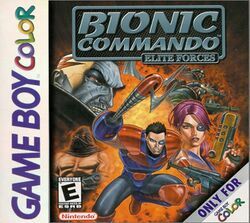 Bionic Commando: Elite Forces is a platformer released for the Game Boy Color in 1999. It is the third original Bionic Commando game. Unlike most games in the series, it was developed and released in Western countries only. ↑ Bionic Commando (Game Boy) is an enhanced remake of the second Bionic Commando. This page was last edited on 14 June 2017, at 11:52.